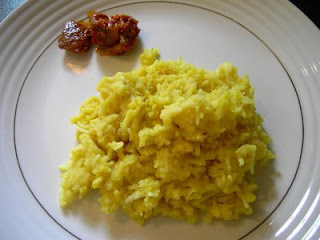 Usha from Samaikalam Vanga blog came up with this recipe some time back. I tried it out and it turned out to be perfect. I have just become a part of the Great Cooks Blogroll and it feels great to be a part of the list that has from food bloggers all over the world. If you have a food blog and wish to share your recipes with other food bloggers, this is the right place to be. Mash potatoes and peas together and add salt, corn flour and turmeric. Make small balls of it . Deep fry these balls. The boiled potatoes and peas should be dry without water. Drain excess oil on kitchen tissue. Heat 1 tsp oil, add ginger, tomato puree, dry masala powders, salt and allow it to boil. Add some water to it and cook for five minutes. I mashed one kofta to make the gravy more thick. Add the koftas in the end just before serving. Garnish with finely chopped leaves. Aloo Peas Koftas ready to serve with hot rotis. 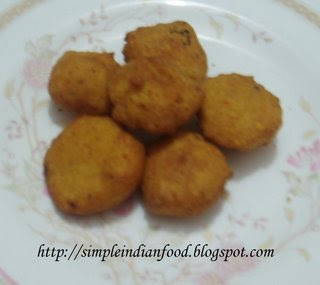 The recipe is same as corn kofta minus corn and adding peas. Mash the cooked rice slightly. Add this and some water and cook for a minute. Add the sugar, cardamom powder, coconut and roasted cashews to it and cook for 2 more minutes. Chop the carrot into smaller pieces and cook in little milk and some water for 15 minutes. Let it cool and then grind it to a smooth paste. Heat ghee and roast the cashews. Add the carrot paste and cook for 2 minutes till the raw taste goes off. Add sugar,cardamom powder and mix well. Add more milk before serving. It can be served hot as well cold. Grind the masala to a smooth paste using water. Heat ghee, add the cinnamon, cloves and cardamom and mix well. Add the masala paste and fry well for 2 minutes. Add some water to it and salt as per taste. Add the coooked vegetables and cook on sim for 10 minutes. Switch off the gas and after 5 minutes when the kurma is slightly cool, add curd and garnish with finely chopped coriander leaves. You could even add other vegetables like carrot and beans to it to make it more healthier. Serve with hot rotis or puris. There are two methods here- one is an instant one while the other requires fermentation. Mix all the ingredients together to get a batter which is a bit thinner than normal dosa batter. Let it aside for 10 minutes. Heat tava and spread out a big ladle of batter in an ciruclar manner. Spread a little oil in the corners and cook for a minute. Turn it and cook on other side as well. If the dosa is not soft, then it requires more water. The batter is same as that of ragi idli. Check out the batter here. Heat tava, spread out the batter in an circular manner and cook on both sides. Serve hot..these would be more softer than the instant ragi dosas. Soak the flour in little water and blackgram dal for 2 hours seperately. Grind the blackgram dal first to a fine paste and then add ragi flour. Mix well or else grind for a minute with the blackgram dal paste to get consistency similar to that of usual idlis. Add salt. Ferment overnight. Grease idli plates with little oil and pour the batter into it. Steam for 5 to 10 minutes. 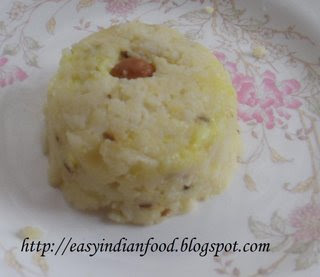 Try putting a knife in the center of the idli and if batter doesnt stick to it, the idlis are done. Cool for 2 minutes and serve immediately with chutney and sambhar. Recipe adapted from Aayis Recipes. Grind tomato, cashews, ginger and 1/2 tsp cumin seeds. Heat oil, add cumin seeds and then the tomato paste. Add garam masala powder, turmeric powder, salt and red chilli powder and cook for 2 minutes. Add peas, paneer and crushed kasuri methi. Cook covered for five minutes. Add the cream and if the gravy is dilute add a thick paste of bengalgram flour and water. 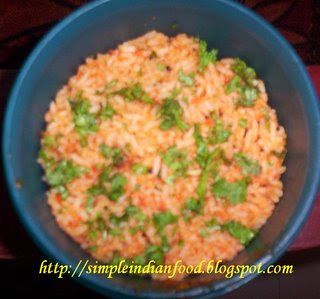 Garnish with finely chopped coriander leaves. 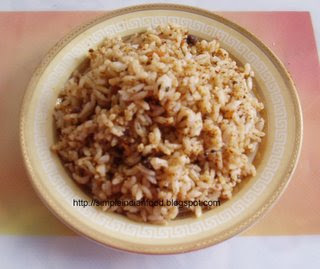 Serve hot with rotis or pulav. Soak the blackgram dal in sufficient water for atleast 2 hours. Grind it with very less water, green chillies, ginger paste and salt. Add the cabbage, carrot and coriander leaves to the vada batter. Heat oil in a fry pan. Slightly wet hands and take a small ball of batter in the hand and flatten it a bit. 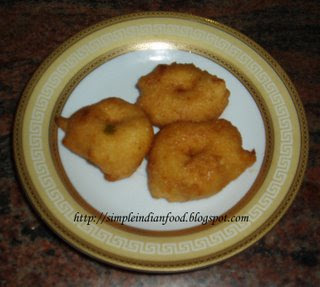 Dip a finger in water and make a hole in the vada in the center. 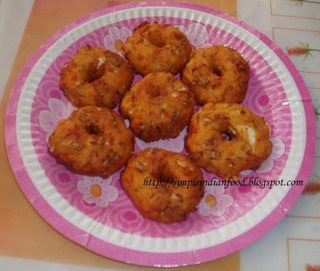 Drop these vadas in hot oil and deep fry till golden brown on both sides. Serve hot with chutneys and sambhar. All of us travel and at times it is difficult to find good food while travelling. So, lets have a Travel Food Festival wherein you can post a non-messy, non fussy, quick to make food item on your blog that you would love to carry along while travelling. Please provide a link back to the event in the post. Even if any of your earlier posts is related to this theme, you could just link back to the event and send me the link of your post with other details. 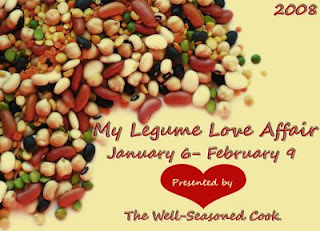 Kindly post only vegetarian recipes for this event. The last date for the event is 29th February. The round up would be sometime in the first week of March. Send me your entries to easycrafts@gmail.com with subject as Travel Food Festival and your name, blog name and link to the post. Non-bloggers can mail me their recipe with the photo. Heat oil, add mustard seedsand blackgram dal. When it splutters, add turmeric powder and green chillies. After half a minute, add the mashed potatoes, salt and mix well. Cook for 5 minutes and add a little water if required. Add finely chopped coriander leaves. Heat tava and spread out a big ladle of dosa batter in a circular motion. Spread out little oil all over aand allow it to cook for 2 minutes. Turn and cook on other side as well. Turn again and keep the potato masala in between and fold the dosa in any way you like. Also you could keep the potato masala in the plate and place the dosa over it in a cone shape. Serve hot with chutneys and sambhar. Make a thick batter of all ingredients except oil and bread slices. Heat oil and when it is hot enough, dip the bread slices in the batter and fry them. Serve hot with sauce. A quick and tasty comfort food.. Mix all the ingredients except oil for papdi with little water and make a soft dough. Make big chapatis of it and cut into small rounds using some round lid. Use a knife to fork it so that it doesnt fluff while frying. Now deep fry these till golden brown and store in an air-tight container. This chat should be served immediately after assembling. Spread out about 6 papdis on a plate. Add some mashed potatoes on each of the puris. Sprinkle some salt on it. Add a little sev, sweet chutney,green chutney and curd on it.The addition of sweet chutney and green chutney is as per taste. Add a lot more sev to it and sprinkle chat masala on it. Garnish with finely chopped coriander leaves. Mix the onions, carrot, ginger paste and coriander leaves well. Heat the tava and add a big spoon full of dosa batter and spread in circular motion. Dont make it thin like dosa...let it remain a bit thick. Spread out the onion, carrot, ginger, coriander leaves mixture on it covering all areas and press it slightly into the batter. Add 2 tsp of oil around the uttappam. When one side turns golden brown, slowly turn it and cook on other side as well for a minute. Serve hot with any chutney and sambar. If you want to serve only onion uttappam, just leave out the carrot, rest of the procedure is same. However adding carrot is more tastier and healthier too. The festival of harvest and joy, called Pongal in Tamilnadu and Andhra Pradesh, Sankranti in Karnataka and Maharashtra, Sankrant in Gujarat, Sakarat in Madhya Pradesh, Lohiri in Punjab that marks the departure of winter, Khichiri in Uttar Pradesh and Bihu in Assam is celebrated in mid-January. In Kerala, it marks the end of the Anushtahan for Lord Ayyappa devotees. It is the time when uttarayan sets in implying the beginning of sun's journey towards north. In Andhra Pradesh, Tamilnadu and Karnataka the festival is devoted to the sun god and a special neivedyam “Sakkarai Pongal” is offered to the god. It is spread over three days and houses are cleaned and decorated with colourful rangolis. In Tamilnadu, the festival is spread over three days known as Bogi, Surya Pongal and Kannu pongal. A bon fire is lit on the first day to chase away all evils from the house. On the day of Surya Pongal, the “PongaPanai” is decorated with turmeric, ginger, sugarcane, banana and coconut. Milk is boiled in it and when it is on the verge of spilling everyone celebrate it by chanting “Pongal o pongal”. Then sakkarai pongal is prepared in that pot and offered to the sun god. On the third day, various mixed rice varieties are prepared and special prayers done for long life of brothers. Jallikaatu is a popular bull festival in rural areas of Tamilnadu where money is tied to horn of bulls and the villagers try to catch hold the bull and thus the money. In Karnataka, a special mix of roasted groundnuts, roasted dal, jaggery pieces, fried sesame seeds, dry coconut pieces is made and distributed among friends and relatives. Also sweet pongal is prepared. Everyone is greeted with the words “Ellu bella thindu, olle maathadu”(thanks Asha for the correction) implying eat these sesame seeds with jaggery and speak nice words. Roast the groundnuts and remove the skin. Roast the white sesame seeds till it starts changing colour. Mix all of them. In Maharashtra, sesame seeds ladoos are prepared with sugar as well as jaggery and distributed among friends. Everyone greets each other with the words ‘til-gul ghya, goad goad bola” implying have these til ladoos and speak sweet words. Roast sesame seeds for some time till colour starts changing. Remove skin of the roasted groundnuts and break them into smaller pieces. Heat jaggery with little water. When jaggery melts and you get a sticky consistency, switch off the gas and add the other ingredients and mix well. Grease hands with a bit ghee and make small balls of the mixture. Kite flying is a part of Sankranti in Gujarat and the skies are full of kites of various shapes, colours and sizes during this period. All families gather in the terrace and fly kites, competing with each other. Kites with lights in the night are a must see view. Chikkis rule at this time of the year. Chikkis made of jaggery and sesame seeds or groundnut or dryfruits are made for the occasion. To make chikkis with jaggery, check out the version of Nupur from One Hot Stove blog. In Punjab, a bonfire is lit on eve of Sankrant and all friends, relatives come together to dance and enjoy the festival. They offer til, peanuts and beaten rice sweets and puffed rice to the bonfire. Uttar Pradesh celebrates the festival by taking a ritual bath and donating khichiri which is made of rice and lentils. In Kerala, the makara jyoti or celestial light is visible on the Sabari mala hill shrine on this day and is considered to be very auspicious. Happy Sankranti in advance to all. Here comes another instant dosa that does not require any fermentation. Mix all ingredients together except oil to get a thick batter. Make dosas with it but dont try to spread much like normal dosa batter. Spread some oil and when one side is cooked, turn it and cook on other side. Mash potatoes, add salt, turmeric powder, red chilli powder and cornflour. Mix well and make small balls of it. Fry them till light brown. (You could even cook them in the microwave if you want to avoid oil). Heat oil and add mustard seeds. When it splutters, add the tamarind extract, salt, turmeric powder, asafoetida, curry leaves and sambar powder. Let it cook for five minutes. Add the koftas to it and cook on sim for 10 minutes. Add water to wheat flour, rice flour and salt to make a batter. Keep it covered for atleast 15 minutes. Take some batter and spread it on hot tava in circular motion. Add a little oil on the sides and when cooked, turn the dosa and cook on other side as well. Instant dosa without any fermenting ready to serve. Any chutney and sambar will go well with these tasty dosas. Roast the masala ingredients(excluding cumin seeds) and grind into fine powder (adding cumin seeds) after cooling. This can be made in larger quantity and stored in an air-tight container for a month. Soak the tamarind in some water and extract the juice. Cook the red gram dal till soft. Add salt, curry leaves and masala powder to the tamarind juice and allow it to boil. Add the cooked and mashed dal along with some more water and allow it to boil for five more minutes. Add finely chopped coriander leaves to the rasam. Heat 1 tsp ghee and add mustard seeds. When it splutters add to rasam. Adding a bit of jaggery would enhance the taste of the rasam. Mix all of them together and serve immediately. Garnish with finely chopped coriander leaves. Clean the spinach and soak it in some water for 10 minutes after adding salt. Squeeze out the water and cook closed for just one minute. The leaves will turn out to be much more greener. Cool and grind to a fine puree. Add salt and spinach puree to wheat flour and mix well. Add more water if required to make a soft dough. Leave covered for 15 minutes. Make rotis or pulkhas the usual way and serve hot with some spicy gravy. Spinach is rich in vitamins and minerals, particularly folic acid, magnesium and vitamin K. Also the protein content in spinach is much more than almost all other vegetables. 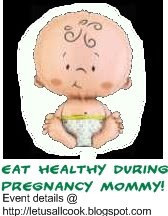 So, it is very beneficial for pregnant women and also another simple way of consuming leafy vegetables. Soak the rajmas overnight and pressure cook them till soft. Grind tomatoes with coriander seeds, cinnamon, cloves and cardamom. Heat oil, add cumin seeds and the tomato paste. Also add turmeric powder, ginger paste, red chilli powder, cumin seeds powder, garam masala and salt to taste. Allow it to cook for five minutes. Add the rajma along with water it was cooked in and potatoes cut into cubes. Let it cook for five minutes. Add a paste of gram flour and water to cook on sim for 2 more minutes to get a thick gravy. Garnish with finely chopped coriander leaves. 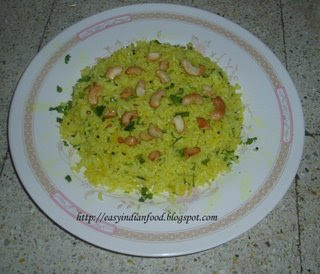 Serve with hot rotis or Jeera rice. Add salt to wheat flour and make a soft dough using water. Let it stay in a closed vessel for half an hour. Mash the potatoes and peas and add salt, red chilli powder, turmeric powder, ajwain and coriander leaves. Mix well and make medium sized balls. Make a bit thick chapati from the dough and place the balls in between. Cover it well from all sides and dip in flour again. Make thick parathas ensuring that the filling doesnt come out. Heat tava and place this paratha and spread some oil over it. Turn and spread some more on the other side too. Cook till both the sides start getting brown spots. Just before removing spread a little ghee over it. Normally parathas are made with full ghee, but this version is preferable if you want to use less of it. Boil water and add salt to it. Switch off the gas and slowly add it to the fine rice flour. Mix well and let it cool for some water. Knead it well to get a soft dough. Add some of the dough into the idiappam press (i used the ones with which i make omampodi or sev)and press it into greased idli plates or idiappam plates whichever you have to make small idiappams. Steam it in the pressure cooker until cooked and serve hot with sweet coconut milk. 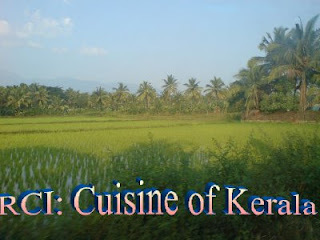 This is my contribution to the RCI : Kerala Cuisine event hosted by Jyothsna of Curry Bazaar.